Magic Red Casino is one of out current favourites and it’s certainly one of the better Playtech casinos out there. As well as a wide range of bonuses for new and existing players it also has a VIP programme that’s worth writing about. All players are eligible for this scheme and the more money you wager, the more extras you can expect from Magic Red. Part of this membership involves the issuing of Comp Points, awarded to players just for wagering certain levels of money. Eventually accumulated Comp Points can be converted into cash – higher VIP members get a better conversion rate – so the more you spend, the more you earn. 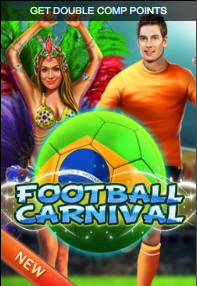 Each month, Magic Red selects two online slots which earn double Comp Points and in June it’s the turn of Football Carnival and Fantastic Four. Go for the progressive jackpot of the Marvel slot or join in the World Cup fun – either way, double points are yours! Visit Magic Red here to find out more.